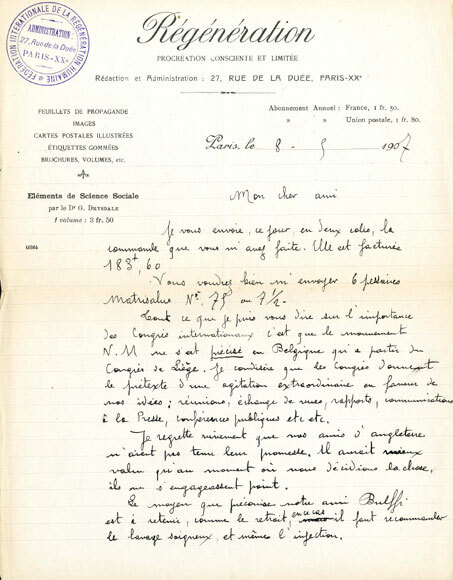 Eugéne Humbert to the NMB, 8 May 1907, sending two parcels, ordering Matrisalus pessaries, commenting on the importance of international conferences, and describing a Spanish contraceptive method. Humbert's letter is written on Régénération's letterhead, the periodical publication of the French neo-Malthusian Ligue de la Régénération Humaine. It was founded in 1900 and led by Eugène Humbert until 1908. Read about the French neo-Malthusians in the comprehensive introduction by Francis Ronsin to the Humbert papers.